QUICK PRIMER ON CURRY LEAVES: If you’re not familiar with curry leaves, it’s important not to confuse them with the term curry. A curry is a dish smothered in a delicious gravy, which is made with curry leaves and a collection of ground spices — usually infused with cayenne or other dried chili peppers. You can also find prepared spice collections that are labeled “curry.” Curry leaves, by themselves, have no heat but they do have a distinctive flavor, which is why they are typically added to curried dishes and are often added to chutneys. Curry leaves are considered tridoshic, which means they are balancing for every constitution. Curry leaves have numerous medicinal benefits, and they are often recommended by Ayurvedic practitioners to support digestion and lower blood sugar. Dr. Naram says that this particular recipe is an ideal remedy for arthritis because of the anti-inflammatory nature of both the curry leaves and cilantro. Curry leaves are also high in calcium, which nourishes the bones. You can find organic curry leaves online. If you need them today, you can usually find them in Indian groceries and sometimes at Whole Foods. 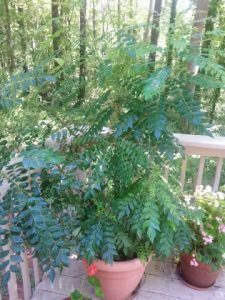 Fortunately, we have our own curry tree at home, which was given to us as a gift from Praveena and Baldev Thakur of Charlotte about a decade ago when the plant was perhaps six inches high. Our tree, which I named Annapurna (after the goddess of food), thrives in the summer on our deck in bright sunlight and lots of water. Somehow she manages to stay alive when we bring her inside for the winter, sitting by a glass door with morning sun pouring in. By last summer she was close to five feet tall after having been repotted several times. This one simple chutney will enliven your most tired old recipes, so you may want to try it on everything from steamed vegetables to beans-and-rice to veggie burgers.